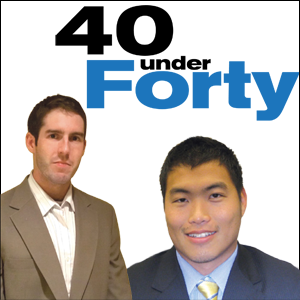 Two Clark School alumni of the Department of Aerospace Engineering are included on this year's Aviation Week & Space Technology "40 Under Forty" list of "rising stars in the global aerospace and defense industry." Keith Allen (B.S. '07), 27, is a senior navigation and controls engineer for Rockwell Collins. He is cited as a redundancy expert and for inventions and innovations for UAV and other systems. Kevin Schoonover (B.S. '06), 28, is director of strategy and business development for missile defense at Alliant Techsystems, where he is noted for the growth of that business line. He also volunteers for several organizations, including on the Clark School's Alumni Chapter Board.